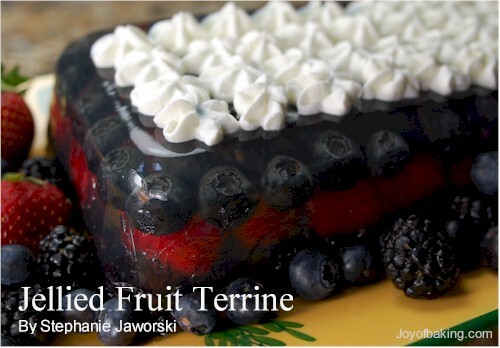 When berries are plentiful and inexpensive this Jellied Fruit Terrine is the dessert to make. It consists of a layer of raspberries, a layer of blueberries and a layer of blackberries, that are all encased in a jellied white grape juice. This is not a difficult dessert to make, it just takes time. 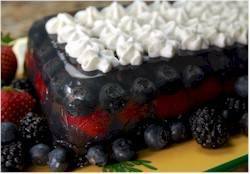 For you need to place one layer of berries covered with jelly in a loaf pan, let it set, and then follow with another layer of berries and jelly. While this may seem time consuming, the majority of the time is waiting for the jelly to set in the refrigerator, so you can be off doing other things. The most important thing is to use good quality firm fruit, making sure to pick through the berries, discarding any that are soft or crushed. Now, the general rule of thumb when making jelly is for every 2 cups of liquid you need about 1 envelope of gelatin. However, you will notice from the recipe that I have used a higher ratio of gelatin to liquid to make this terrine. The reason for this is that the gelatin has to support three layers of fruit so to do this the jelly needs to rather firm. There are two types of gelatin, powdered and leaf. For this recipe we are using powdered unflavored gelatin to make the jelly. For those unfamiliar with unflavored powdered gelatin, it is sold in the baking section of grocery stores. It comes in small boxes which hold four paper envelopes of powdered gelatin. Each 1/4 ounce (7 grams) (scant tablespoon) envelope of gelatin will jell about 2 cups (480 ml) of liquid. Unflavored gelatin is tiny granules that are tasteless, colorless, and odorless. It is used as a thickening agent but only becomes active when dissolved in hot water. To use gelatin you first need to sprinkle it over a cold liquid (about 1/4 cup (60 ml) of cold liquid for 1 envelope of gelatin) so the gelatin softens and will combine evenly and smoothly with the other ingredients in the recipe. The gelatin should be allowed to soften, untouched, for about 5 minutes so the granules will swell and become spongy. The softened gelatin then needs to be warmed so the gelatin granules dissolve and the proteins become activated (gelatin is completely dissolved at 105 - 115 degrees F (41 - 46 C)). You can do this by either adding the softened gelatin to hot liquid, or, the softened gelatin can be heated. (To check to see if the gelatin has completely dissolved, dip a spoon into the gelatin and check to see that all the crystals have melted.) Just make sure the gelatin does not boil. Above 150 degrees F (66 degrees C) the gelatin breaks down and will not resolidify when cooled. As I mentioned above, unflavored gelatin is also available in clear, paper-thin leaves (or sheets). It is widely used in Europe and can oftentimes be found in gourmet and specialty baking stores, or through mail order. To use, you need to first soak the sheets in cold water until it looks like wet plastic wrap. The sheets are then heated until liquefied. The two types of gelatin can be interchanged. To begin, discard any crushed, soft or bruised berries. Have ready a 8 x 4 inch (20 x 10 cm) loaf pan (6 cup). In small bowl, pour 1/2 cup (120 ml) of cold water. Sprinkle the two envelopes of gelatin over the water and allow it to soften, untouched, for about 5 to 10 minutes. Meanwhile, in a small saucepan, heat 1 cup (240 ml) of the white grape juice until very hot. Stir the softened gelatin into the hot grape juice and place this mixture over a low heat and stir constantly until the gelatin has completely dissolved. Do not boil. Remove from heat and stir in the remaining 1 1/2 cups (360 ml) of white grape juice. After about 30 minutes, arrange in rows, a layer of raspberries on top of the jelly. Carefully spoon or ladle some of the white grape juice jelly over the raspberries, just until the raspberries are covered. Place back in the refrigerator for about one hour, or until set. Next, place a layer of blueberries on top of the raspberries and cover with more of the white grape juice jelly. Place back in the refrigerator for about one hour, or until set. Finally, place a layer of strawberries on top of the blueberries. Carefully spoon enough of the white grape juice jelly over the top of the strawberries to cover them. Cover and chill the terrine for several hours, preferably overnight, until completely set. If you wish to unmold the terrine, either place in hot water or use a hair dryer to loosen the terrine from the sides of the loaf pan. Invert onto your serving plate and unmold. If not serving immediately, return to refrigerator. Serve the terrine in slices with softly whipped cream. Serves about 10. Preparation time 45 minutes. Note: Could also use blackberries, currants, or pitted cherries.